I am just back from Brothers' weekend - an Estill brother tradition for 20 plus years. It was a great weekend (although we still miss my brother Mark). I find on brothers' weekends I often laugh more in a short weekend than I do in a month. The weekend was held at my youngest brother, Lyle's house in North Carolina. At first I was honoured to be invited to help solve the Greece problem but when I arrived I found out it was a grease problem (my brother Lyle owns a Biodiesel plant). Busy weekend. I helped Lyle deliver a truckload of biodiesel (well, perhaps not helped but road shotgun). We kayaked on the lake and saw a bald eagle. 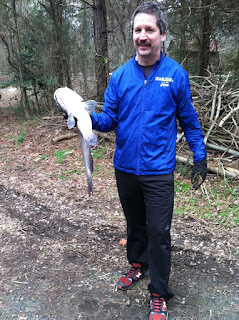 While Glen and Lyle built a new chicken coop, I caught dinner in his catfish pond. Lyle is a lot more self sufficient than I am. And of course we played lots of cards and reminisced. We remembered with fondness when we were young boys asking mom what we could do. She replied "you could always go beat up Lyle" (teasing mom). On the flight I read an awesome book - Ownership Thinking - How to End Entitlement and Create a Culture of Accountability, Purpose and Profit. See the review on the Canrock Blog. I wish this was something my family could do. In fact, it will become a tradition beginning this year. Thank you for the motivation and the idea. My brothers live in California and Florida, so there is no excuse big enough to keep me from pulling them together for this. It is amazing how sometimes you can compartmentalize your life and practice things at work that never occur to use at home. Brothers weekend sounds like a blast Jim! Especially the fact that you could do some fishing while solving the worlds problems.